Our Field Service Engineers try to get these “Call for Service” stickers on all of the Uninterruptible Power Supply (UPS) and Power Conditioning units we service so it is easier to get a hold of us in emergency situations or when replacement batteries are needed. However, if your equipment does not have a sticker or you would like additional stickers, just send a quick email to info@titanpower.com or contact us letting us know how many you would like mailed to you. We are always amazed how often these stickers are put to good use. They are handy not only during normal working hours for quick reference, but really prove their worth at 2:00AM when the equipment goes down, and a limited support crew or individual scrambles to make sense out of how to restore power. 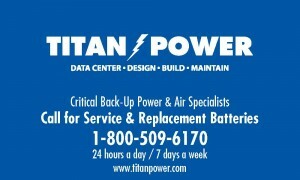 This entry was posted in Back-up Power Industry, Company Misc., Customers, Facility Maintenance, Uncategorized, Uninterruptible Power Supply and tagged Emergency Power Systems, Emergency Service, Titan Power, Uninte, Uninterruptible Power Supply, Uninterruptible Power Systems, UPS Batteries, UPS Systems. Bookmark the permalink.